Alpine Companies have more experience than any other foundation repair contractor in Denver using epoxy resins that are injected into the cracks in your foundation walls, and the good news is the cracks in the concrete foundation will be stronger than existing concrete. We mix the epoxy right before injecting it into holes drilled in the concrete foundation so it goes right into the crack at predetermined locations in your foundation or basement walls to insure no water enters your home. Epoxy repair or polyurethane injection as it’s called solves a real problem because the concrete in foundations expands and contracts with changes in temperature. In the summer when the temperature rises, the concrete foundation or basement walls expand, and the cracks tighten up, and during the winter the concrete contracts and cracks expand or open up and that allows water to enter your home. The good news is we can do the repairs on a cold day too! Make sure the product used on your foundation will bond. Many companies are using products that won’t bond to wet or cold concrete or don’t allow the concrete to expand or contract and still maintain a bond with the area repaired. This causes the cracks to reopen and create gaps between the concrete and the epoxy that allows water to come through the basement wall or the foundation into the house. You won’t have this problem with this great epoxy from Dow. CONTACT us today for all your foundation epoxy repair needs! 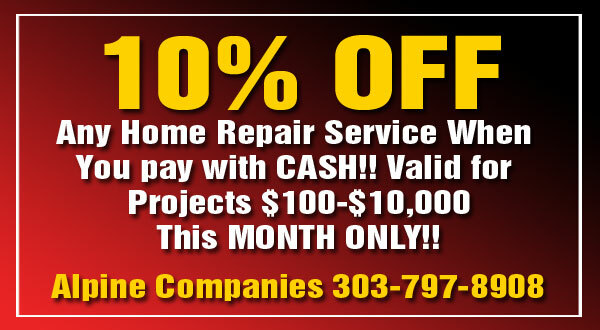 Alpine Companies guarantees the highest quality foundation epoxy repair at the best possible price!